Highlights – The unique green wilderness of the Army firing ranges, the Ghost Village of Tyneham, Kimmeridge Bay Marine Area. Navigating the Lulworth Firing Ranges. The next 7 miles of the South West Coast Path cross the Army Firing Ranges between Lulworth and Kimmeridge. Timing is key here as its superb walking BUT the ranges are heavily restricted, only open at weekends (and not every weekend at that) and longer periods in the Summer and Easter holidays. When the ranges are in use, access between here and Kimmeridge is impossible on the coast and options are either to miss out the section with a transfer, walk a long 13 mile inland diversion or take a transfer to Corfe Castle to rejoin the coast path on a pleasant walk from the interior. Contact us to check on Firing Timetables, accommodation and the best options for you depending on the date you will arrive here. Accommodation is very scarce between here and Swanage and we usually set up transfers from the Pub in Worth Matravers to and back from your next overnight accommodation. The remote route today to Kimmeridge Bay is the most demanding sections of the Dorset Coast Path. The whole coastline is a protected site of special scientific interest particularly unusual as the absence of farming for over 60 years has led to a unique eco system developing with rare birds, flowers butterflies and the largest wild herd of Sika Deer in the Uk. All of it unfettered and untouched by fertilisers and modern farming techniques. It's a surreal landscape with abandoned tanks and armoured vehicles adding to the backdrop of the ocean. You enter the firing range through scrub high above the chalk cliffs at the Fossil Forest, the most complete record of a Jurassic Forest in the World. Here spot bulbous fossilized remains of conifer type tree stumps from a forest that sat here over 100 million years ago, part of a long lost saline lagoon. The Dorset Coastal Path now skirts the stunningly unspoilt Mupe bay with its Mupe Ledge rock formations moving on to a series of zigzag climbs above sheer cliff through open grassland and gorse scrub Lulworth Castle creeps into view as you pass through the majestic grassy earthwork ramparts of the 4th C Iron Age Fort at Flowers Barrow. Another surreal sight with half of the original fort missing, having disappeared over the encroaching cliff edge but its a breathtaking spot. 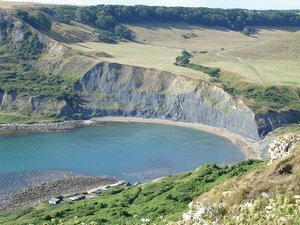 A huge climb and almost vertical descent brings the narrow peninsular of Worbarrow Trout and Worbarrow Point with superb views over this most remote bay with its multicoloured cliffs of red, brown and orange. Long abandoned remains of some fisherman’s cottages share a lonely spot on the cliffs with the kestrels here. Slightly inland of the South West Coast Path you can now visit the deserted ghost village of Tyneham. A settlement since the 13thC, in 1943 the Army requisitioned the firing ranges as part of the War Effort and ordered the 252 villagers out, virtually overnight. A sign hurriedly left on the Church door said "Please treat the church and houses with care; we have given up our homes where many of us lived for generations to help win the war to keep men free. We shall return one day and thank you for treating the village kindly"
Back on the Jurassic Coast Path Tyneham Cap is the last big climb before you reach Kimmeridge Bay a nodding donkey oil well pump the unexpected welcome here. Oil was discovered at Kimmeridge in 1959 and at one time this was the most productive well in the UK. The bituminous oil rock here has long been fashioned since Roman times for trinkets, bangles and armlets, the oil rocks themselves can sometimes be set alight with a match. The superb Purbeck Marine Wildlife Reserve is sited here with interactive displays including a rock pool aquarium for those who don’t want to explore the beach itself. Its a unique and unspoilt marine environment due to its rocky ledges which make it one of the most accessible marine wildlife spots in the UK. If you have time during a lunch break you can hire a mask and a map and a short buoyed Snorkel Trail leads snorkelers through a variety of seabed habitats, including sandy seabed, rocky reef, Japanese seaweed garden, sea lettuce and kelp fields. Inland of the bay the village has a welcome Cafe and in the church you will find 4 sobering headstones of coastguards all who died aged 26 in the “execution of their duty” along the Dorset Coast. A steep ascent on steps brings you to the Clavell Tower a bizarre 19thC folly with its 12 Tuscan columns and parapets, its most famous visitor was Thomas Hardy who would bring the local coastguards daughter here in his early years ! This is the tower committed to print in The Black Tower by PD James. Perhaps most remarkably the whole building in danger of collapsing into the sea was dismantled in 2002 and re-erected stone by stone in its present position 82ft inland. You now end a long day on glorious section of the Dorset Coast Path running above the Kimmeridge Ledges past the waterfall at Freshwater Steps. Then a final steep ascent over the limestone topped Hounds Tout Cliff before the path descends around the compact bay at Chapman’s Pool to within striking distance of the village of Worth Matravers and the excellent Square and Compass Pub!